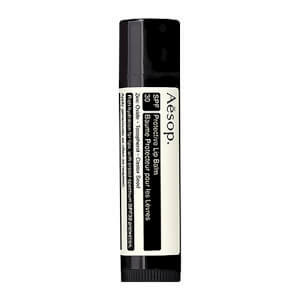 The Aesop Protective Lip Balm with SPF 30 provides intensive nourishment for dry, chapped lips. Offering UVA and UVB filters to protect the fragile skin from harmful sun damage, the balm is enriched with Jojoba Oil to soften and hydrate, whilst Tangerine Peel Oil adds an uplifting citrus fragrance. Compact and convenient for on-the-go applications, it leaves lips feeling sumptuously softened and restored. Free from silicone, paraffin, beeswax or other animal-derived ingredients.